For fun, I thought I'd pop into iTunes and see what's popular there right now. 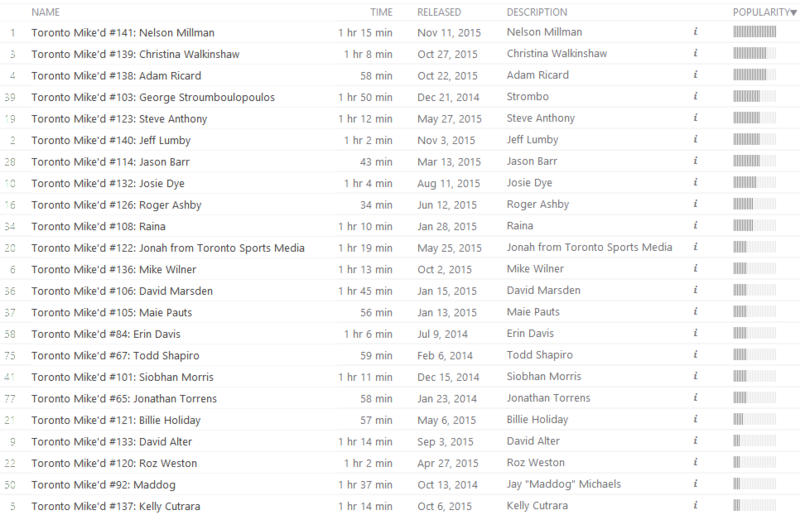 Here are episodes of Toronto Mike'd ranked in order of current popularity. But first, two important details to note. Recent episodes are favoured, obviously. iTunes doesn't publish the algorithm that drives this chart, but it's most definitely time sensitive. This is not an all-time ranking. iTunes only knows what's played via iTunes. So anyone who streams an episode from this site, downloads the MP3 directly or plays Toronto Mike'd in any other podcast aggregator isn't counted here. Not surprisingly, the most current episode is #1, but look at #4. That's the Strombo episode from last December. It's still incredibly popular. I tweeted this screen cap and Strombo responded. It seems he's up for a sequel. I'm game. After 141 episodes, my little podcast continues to hold it's own, currently ranked #14 in its category. Not bad for a guy in his basement. I download the mp3 and stick it on my walkman. 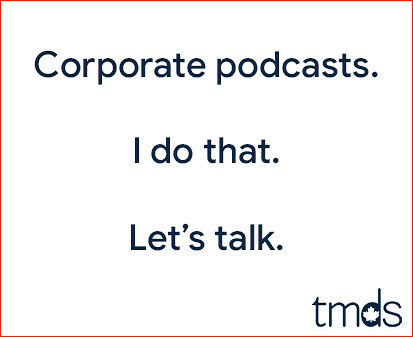 I've probably listened to more than half of your podcasts since the beginning (yes, I am a day one-er) and the podcasts have improved by light years from then till now. One of your guests said you just have to keep on doing it, it's the only way to get better. You have succeeded! For the record, I have listened to all of the sports guests, many of the DJ's, and a smattering of the ones with entertainers, Elvis, Rosie, and others. The Lumby episode was awesome and I will get to Nelson this weekend. I hope you can get Michael Landsberg on the show. He's a great guy and I have a personal connection with him. I also hope you still find this to be an enjoyable hobby, Mike. I certainly enjoy listening and they make my treadmill workouts go by more quickly! So tell us there moderator how many downloads? Your rehash friends refuse to mention audience numbers as do you. I haven't looked at the number of downloads in about 9 months. To be honest, I'd do the same show if I had 200,000 downloads than if I had 200. I am also a long time listener. I am sure you have thought of monetizing this Podcast (via something like Patreon). I was wondering why you haven't? Couldn't you then hire someone to get more guests to appear on your Podcast? You currently seem very Radio focused. Have you thought of expanding to other Toronto people like politicians for example? Thanks for scrubbing out the episodes when I was on. That would have been embarrassing for your other guests. The radio focus is unintentional. My next guest, for example, is a film reviewer who worked for the Toronto Star. I've also had non-radio people like Jonathan Torrens, Ash from USS, Melissa DiMarco, Mark Hebscher, Jeremy Taggart, James Mirtle and others. I doubt I'd want to talk to a politician, however, as I'm frustrated by their non-speak and refusal to leave the script. I'm not sure you can real talk with a politician. But I am open to just about anyone I find interesting. As for monetization, I've gone back and forth on this one. I was set to launch a Patreon campaign in September, and changed my mind. But you're right, securing guests is the most difficult part, and I have little time for it. Good work Mike. I think the cool thing is you show the regular side of people we see in the media, the conversations are very genuine, and you are getting better with each episode.